AllegroMedical.com gladly offers some of the very best quality insulin syringes for sale, including syringes for insulin or insulin needles. With options from some of the best brands, including Monoject by Kendall (Covidien), Safety-Lok Syringes by BD, Micro-Fine by BD, and many styles from Prodigy Diabetes Care, among others, you can find the right insulin syringes for your needs. With syringes for insulin in many styles and quantities, you can also save on insulin syringe & needles supplies. AllegroMedical.com offers only the highest quality insulin syringes, needles and accessories at the lowest prices guaranteed. See our Best Price Guarantee for more details. 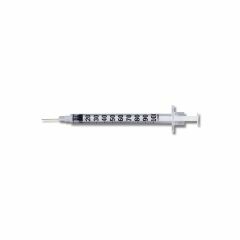 Monoject Softpack Insulin Syringe 3/10cc - 29g x 1/2"
Monoject Insulin Safety Syringe - 1mL 29 x 1/2"
Monoject™ 3/10 mL Insulin Syringe, Permanent Needle, 30 G x 5/16"
Monoject™ 1 mL Insulin Syringe, Permanent Needle, 28 G x 1/2"
Monoject™ 1 mL Insulin Syringe, Detachable Needle, 25 G x 5/8"
Monoject Softpack Insulin Syringe 1/2cc - 28g x 1/2"